In June 2018 we updated our SEN information report checklist and our model policy (section 5.12) to refer to the information you must include about how you support pupils with disabilities. We have created a model SEN policy and information report. Approved by Forbes Solicitors, this model document is designed for you to adapt to suit your school’s context. All of our model documents take account of relevant requirements and good practice. They are easy to adapt, will save you time and help you keep your school compliant. For more model policies and complete policy support from The Key, see the policy bank. We have also produced checklists of the required contents if you prefer. The information in these is taken from paragraph 6.79 to 6.81 of the SEND Code of Practice and the Special Educational Needs and Disability (SEND) Regulations 2014. Schools have a duty to publish a special educational needs (SEN) information report, which must be made available on their website. This is a requirement under the regulations linked to above. This is set out in the SEND Code of Practice (linked to above, see paragraph 6.2, 6.79 and the introduction to chapter 6 on page 91). Special schools that are established in hospitals are exempt from this duty, as set out in regulation 51 above. As you need to publish an information report detailing the implementation of your SEN policy, you must also have an SEN policy. However, there is no requirement to publish this as a separate, standalone document. The policy should help you complete the SEN information report and act as a framework for the report. This was explained to us by the DfE. The information published in the report should be updated annually and any changes to the information occurring during the year should be updated as soon as possible. This is set out in paragraph 6.79 of the SEND Code of Practice. The SEN information report must be approved by the full governing board. Our associate education expert Jackie Beard explained that this means the governing board should receive, scrutinise and approve the SEN information report before it is published. This is explained in paragraph 6.81 of the SEND Code of Practice. 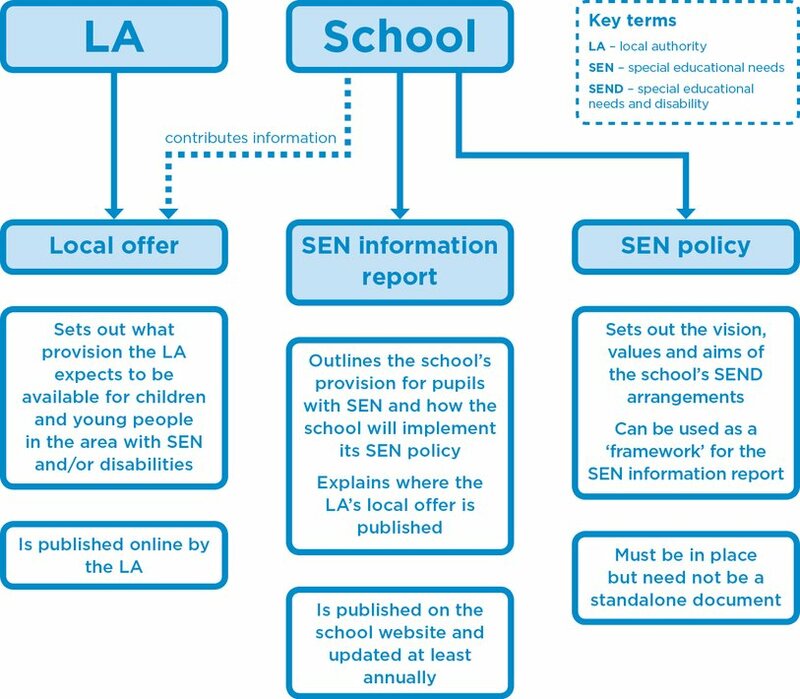 We give an overview of the purpose of the local offer, SEN information report and SEN policy and who creates each in the following diagram. One of our articles explains the local offer in more detail. CPD Toolkit from The Key provides school leaders with everything they need to deliver high-impact and cost-effective in-school training for teachers, leaders and support staff.